As noted last week, in this new, intimate era of sports, we have seemingly unlimited access to games, sometimes practices, and even players’ thoughts. To say that Twitter has revolutionized the way we follow sports might be an understatement. Twitter has created a space for this intimacy between fans and players far more significantly than any other website or device. Admittedly, the culture of technology has advanced in every way, but nowhere else are athletes publishing their personal experiences so frequently and candidly. A really fun example of the closeness we now experience via Twitter occurred a couple summers ago, during the NBA lockout. 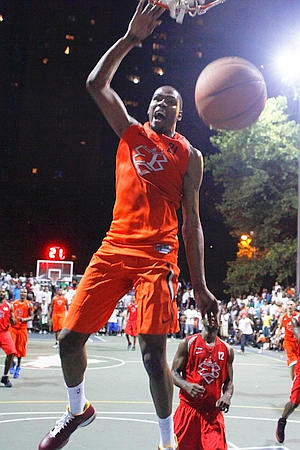 Star players were showing up across the country for benefit games and pickup ball, and Kevin Durant decided he would pay a visit to the famed Rucker Park in New York City. News broke on Twitter less than twenty four hours before Durant appeared, and videos were released on Twitter that grabbed the nation’s attention of Durant’s 66-point game. Even while Twitter helped organize a group of fans at Rucker Park that night to watch Durant in person, the social networking site brings an even deeper sense of intimacy with direct tweets from players. I can’t imagine being 8 years old and seeing photographs of Michael Jordan right after a workout like LeBron’s recent post, or seeing MJ before a medical procedure like Kobe posted of himself in the hospital. Here James Harden jokes about doing a Euro-step in the grocery store. As basketball has come to be known as an increasingly “black” sports culture, the connections between Twitter and the NBA refutes any idea of a digital divide. Fans across class and race look to Twitter for their sports news first. As we continue to envision what this means for basketball and for culture, we should remember Afrofuturism’s emphasis on the intersections between race and technology.